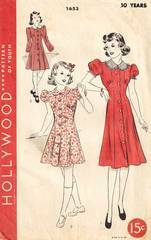 Vintage Hollywood sewing for girls dress with semi-princess seaming. Front buttons from neck to hem. Flat shaped collar and long or short sleeves. Pattern is unused and in original folds. Unprinted, perforated pattern pieces.